Posted on 11/4/2014, 9:21 am, by rackycoo, under General Projects. When cold weather arrives, keep your noggin warm with a cozy knit or crocheted hat. Sometimes, not just any hat will do; you want to show off your fun side. 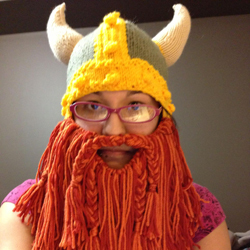 Here are some great “mad hats” found on Craftster.Show ’em you mean business with a knit Viking hat. This one, by MidoriMentality has an attached beard. 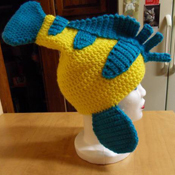 ErintheRed02 made this Flounder hat for her friend, who’s a huge fan of Disney’s “The Little Mermaid”. 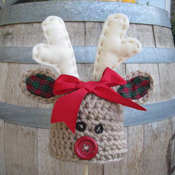 How cute is this little reindeer beanie, by snickeson? Don’t you just love that big red bow and those little plaid ears? 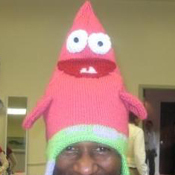 Here’s Spongebob Squarepants’ friend Patrick, knit up by sallymayhomer. He’s just quietly perching on an acquaintance’s head. No one could be sad wearing a hat such as this. 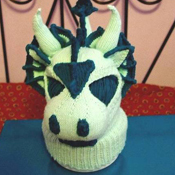 This dragon ski hat by chek101 would really keep you warm, as it’s actually a full ski mask. Wouldn’t it be fun to wear this while “roaring” down the slopes? Hats off to these creative hat makers! If you click on the “hat” tag on Craftster, you’ll find tons of hats of every sort: striped, patterned, serious, or playful. I’m sure you’ll find some that suit your personality.